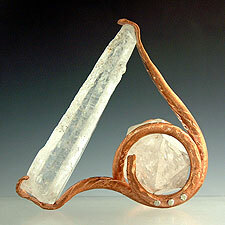 This sculpture, entitled "Nautilus," is crafted with two raw crystals. If Iron Age jewelers had access to the Internet -- if they could buy rare and precious materials from all over the worldóthen their jewelry might look something like Brattleboro jewelry artist Bob Borter's newest, rawest, boldest, most striking work. 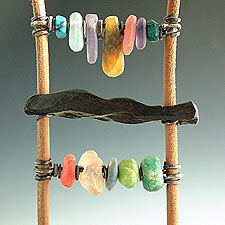 Borter, 58, has been creating one-of-a-kind jewelry in his studio since 1984. Until now, his work has been known for its futuristic, sleek, well-engineered, classic, symmetrical, modern designs. Not anymore. After experiencing a creative epiphany, Borter's jewelry has become primal and elemental while still maintaining its high degree of fine craftsmanship. "Earth is the ultimate muse in this body of work and my intent is to allow that spark to inform my process and convey it as one gazes at, holds, and wears a piece," Borter said. Working with organic materials like raw crystal, obsidian, turquoise, black coral, mastodon tusk, agate geodes, oxidized silver, Vermont smoky quartz, black tourmaline, opal, raw ebony, peridot, rare Damele turquoise that comes from a near-extinct mine in eastern Nevada, and fossilized ivory walrus tusk that washes up from melted Arctic glaciers, Borter has created rings, neckwear, earrings, and small sculptures with deep colors, rich textures, and intriguing shapes. 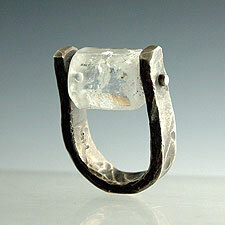 Borter, who began as a painter, became a jeweler at a very young age. 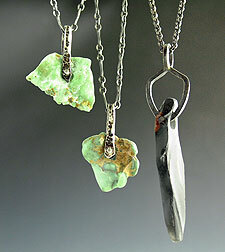 "At 17, I ran away from home, went out West, bought a few tools and wires, and made some jewelry," Borter said. "I brought it to a shop and they had a check for me the next month. So I just kept going. At 21, I was making jewelry that Indians were wearing in their dances. So it clearly was a calling. This is what I was supposed to do." Since then, Borter has been creating contemporary art jewelry, wedding rings, engagement rings, and meaningful jewelry for thousands of clients in the U.S. and around the world. In addition to his work being worn in tribal dances, he has been featured on the cover of Vogue Germany and represented in some of the most influential galleries in New York, including Robert Lee Morris's Artwear. The new work will be shown at Gallery in the Woods, 145 Main St., Brattleboro, VT, 802-257-4777, opening on Friday, October 5, 2012 to coincide with Brattleboro's Gallery Walk. This exhibit will run for two months.